Since the birth of Mankind, criminal acts are visualized. These acts have grown to become more polished due to the trending phase of development of our Planet. This crime can be in the form of stealing, snatching, Killing and many other violations. On a Shorter note, according to recent studies, Crime is the violation of LAW made by the jury. The person who does this is called a criminal. People tend to overcome these crimes using the help of passing laws and protection provided by police. The administrators of Law, are called Lawyers. By studying this degree on the consent of becoming an anti-felony (Crime) a person adopts difference between LLB 3 years or LLB 5 years in his or her Educational Career. This approach towards the hatred of criminology arrives in the minds of those people who are strictly again violation of Rules and Regulations and become a Lawyer. Q: Which University is Best for LLB 3 Years? Punjab University was established in 1868 and has over 1500 Students at the moment. The institute is located in Lahore. Affiliation of this Institute is with the University of Punjab and it is also affiliated with Higher Education Commission (HEC). It is serving many programs for under graduate, Post graduate students. The University also serves Diploma Programs in the means of Law. Q: Which University is Best for LLB 5 years? Quaid-e-Azam Law College was established in 1998 it has more than 1200 students which is a huge number. The establishment is located in Lahore and provides different law degrees for under and Post graduates. 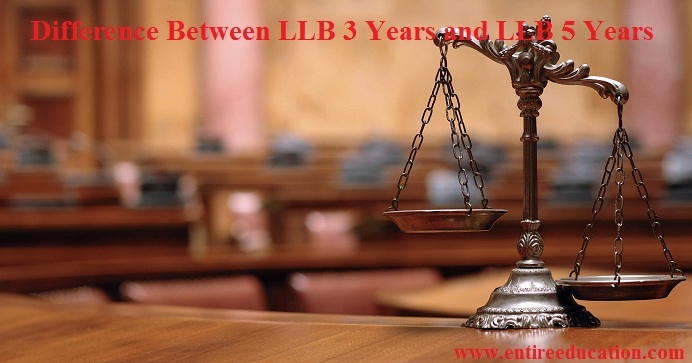 Q: Which is better LLB 3 year or 5 year? According to the best Law program, our team would suggest the 5 year program. LLB is better when it is more polished. The benefits are that students get a BA degree and a LLB degree both after the completion. The Syllabus is more covered in this duration and it makes more sense when the teaching pace is slower and steady. These are the famous jobs after the completion of bachelors. Some of degree holders often go into Politics and other fields due to their skills.